Ryuu says this to transform into Artemis Knight. Raising his henshin stick, silver moons and gold stars emit from it, bond to him, creating his fuku. Silverish grey pants, headpiece, and choker. Black shoes and a white dress shirt. This is Artemis Knight's only attack. A bright white light flows from his hands and he sends it crashing down on the target, like a giant tidal wave. 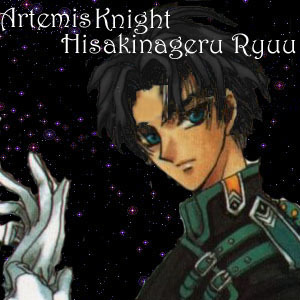 Ryuu OR Artemis Knight says this to transform into Silver Artemis Knight. Same transformation as before, but his choker and headpiece have his sign as a silver pendant. This is Silver Artemis Knight's only attack. A full lunar eclipse occurs as he raises his hands, both pendants glow and the light from the eclipse freezes them still. Ryuu OR Silver Artemis Knight says this to transform into Golden Artemis Knight. Same transformation as before, but he weilds a white-bladed, silver handled sword in his left hand with his sign on the handle. This is Golden Artemis Knight's defensive attack. Cupping his hands together, rocks that look like asteroids begin to fly at the target, crushing them. This is Golden Artemis Knight's offensive attack. A white mist fills the air as he says this and it blinds the target, and fills the hearts of the Senshi (Greek or Sailor) with courage and strength.